Born in Madrid in 1969. He began studying music at the School of Music of Torrelavega under the direction of his father. Later he entered the Royal Conservatory of Music in Madrid, where he studied piano, harmony, counterpoint and fugue with Agustin Serrano, Valentin Ruiz, Daniel Vega and Juan Carlos Panadero respectively, earning honors in Harmony and Honor Prize in the discipline of Fugue. He studied composition with Valentin Ruiz, his former professor of Harmony, obtaining honours in first grade. He concludes the intermediate levels in Harmony winning the Honor Prize with a “Suite for chamber orchestra.” He finished the higher degree of composition under the tutelage of Anton Garcia Abril and Zulema de la Cruz, with whom he studied instrumental and electroacoustic composition. He won the Honor Award in Composition of the Jacinto Guerrero Foundation with the work “Ricercare” for symphony orchestra, a work tribute to J. S. Bach on the 250th anniversary of his death. He has been a scholar of the Marcelino Botin Fundación for five years, and this scholarship has allowed him to increase their knowledge through different courses, with teachers such as Laszlo Dobsay, Salvatore Sciarrino, Samuel Adler, Robert Pascal, Luis de Pablo, Joan Guinjoan and Carles Guinovart. 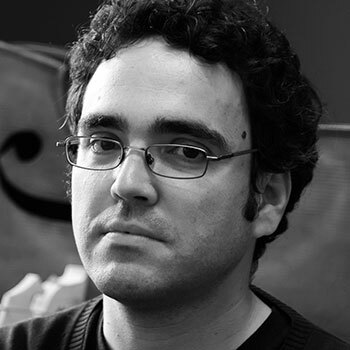 He has premiered works at several festivals such as “Festival Punto de Encuentro”; the “Cycle of Musical Creation in Cantabria”; the “Festival of Contemporary Music in Three Cantos” (Madrid); the “Santander International Festival”; the “International Festival of Contemporary Music of Madrid”; “Las Edades del Hombre”; the “Festival Internacional Cervantino”; the XIX Festival of Contemporary Music in Havana; the “Zitadelle Spandau” (Berlin); the “Campus Musicalcázar 2000”; the “Aula de (Re)estrenos” of the Juan March Fundación (Madrid); at the “Institut für Romanistik”, University of Potsdam (Berlin, December 2007); in the “Seventh Congress of the Spanish Society of Musicology” (Cáceres 2008); in the “2nd Festival Spanien Modern” (Musikverein, Vienna 2008 ); in the ” Spanish-German Meeting 2011″ (Palace of El Pardo, Madrid 2011) and in the “Anthology of Composers of Cantabria” Marcelino Botin Foundation (Santander 2009). Among his later works include a commission from the Jacinto e Inocencio Guerrero Foundation to mark the 25th anniversary of its creation, a project involving composers such as Thomas Marco, Sánchez Verdú and Luis de Pablo, among others. Also a commission to commemorate the 50th anniversary of the death of the conductor Ataulfo ​​Argenta, whose edition includes text and graphic works by leading artists of the culture of Cantabria. Both works have been published and recorded. He was a member of the group of composers “Talea”, and since 2002 he is a member of the ” Madrid composers Association “. He is currently professor of composition at the Conservatory of Music “Bonifacio Gil” of Badajoz, Spain. This past year two of his works were presented in CD: “Glocken” for solo piano, recorded by pianist Manuel Escalante and “Glockenlieder” for Piano Quintet, recorded by Ensemble Vega with the pianist Angel Jávega, the latter under the sponsorship of the Marcelino Botin Fundación of Santander. In Sevilla on a street corner I noticed the multiplicity of simultaneous visual and audible events all going together in one’s experience and producing enjoyment. It was the beginning for me of theater and circus. … (John Cage). Novel Samano Calleja : The experience lived by Cage in Seville in 1930 during a trip to Spain, served as a starting point for composing a musical piece that had a Spanish dance as “leitmotiv” apart from the figure of Cage himself. On the one hand Iam using the structure of the fandango of the eighteenth century. The fandango was a typical courtship dance in Spain at that time, of ternary rhythm and related to the Jota. The fandango I use is specifically the one of the third act of the opera “The Marriage of Figaro” by Mozart, opera set in Seville. On the other hand, and since the work is a tribute to John Cage, I use as a “soggetto cavato” the transcript of his patronymic in musical notes according to the English nomenclature, that is: CAGE = C-A-G -E The piece is formally presented in a number of variations or differences, very typical of the fandangos by Bocherinni Soler and Scarlatti, in which Mozart’s fandango is transformed from the very beginning by sounds and rhythms borrowed from the language of Cage, although not inCage’s way. And finally, another meaning of the word fandango is “noisy”, even “messy” or “troublemaker”, these very appropriate words to represent the bustle of the streets of Seville or to represent the controversial aspects of the artistic personality of John Milton Cage.